Richard has been drawing and painting almost since he was able to hold a pencil. His family background is full of artistic and engineering talent, and it was with the help of his artistically gifted Aunt that Richard first became engrossed with the world of painting. Aided not inconsiderably by her generous gifts at Christmas and Birthday’s ensuring a steady supply of materials. Richard remains largely self-taught, he was regarded as gifted art student at school but was encouraged by his parents to train for a ‘proper job’ and subsequently followed a career in engineering. The artistic ambitions remained but purely on a spare time basis. From the age of about ten years Richard started taking an interest in motor racing and aviation and following visits to air shows and motor racing events inevitably this interest was transferred into his early drawing and painting efforts. Much later it was undoubtedly the combination of Richard’s engineering and artistic talents that were to prove pivotal in his artistic career. Today his paintings have become much admired for their high level of accuracy and meticulously researched technical and historical details. 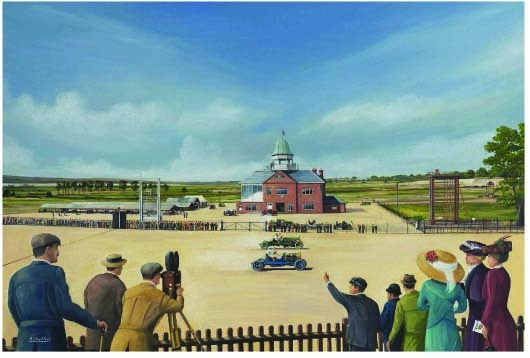 Richards first public art display was at the historical site of Brooklands Motor Course in 1982. Encouraged by the success of this first show he repeated his displays at the event for several years. Since those early showings he has exhibited at many prestigious venues, from specialist London galleries to a restaurant in Monaco and a show in Connecticut USA. 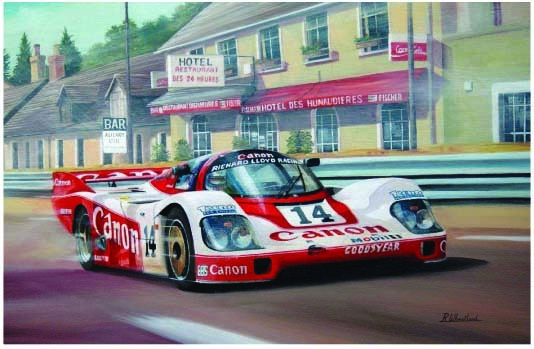 More recently Richard as become very much part of the motoring art establishment, his work is regularly featured in group art shows at well-known motor sporting venues such as Silverstone and Goodwood, after over twenty years in the business Richards work now graces many private collections worldwide. Many will recognise Richards’s work from his Christmas card paintings for the Motor and Allied Trades Benevolent Charity ‘Ben’. Richard is a great supporter of this fine cause and has worked closely with them since 1989. His card designs have become highly sort after each year and continue to raise much-needed funds for the charity. Richard has also been involved with many other ‘Ben’ projects, limited-edition prints, newspaper advertising and brochure covers. 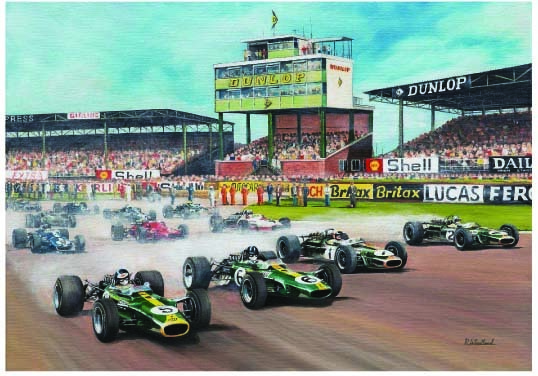 Many of his paintings and prints have been used to raise funds for Ben and as part of that process have been signed by many famous motor racing names:- Juan Manuel Fangio, Sir Stirling Moss, Denis Jenkinson, Sir Jackie Stewart, John Surtees, Murray Walker, Tony Brooks and Lord Hesketh to name but a few. Richard has also illustrated for two books and currently has a growing range of greetings cards available for sale at both exhibition and via his website. He has become accepted in all spheres of transport art with his aviation and maritime subjects receiving ever increasing attention and It is not unusual to find a combination of land, sea and air subjects used in a single painting. Richard also returns to his original love of landscape and architecture for inspiration and often marks a special visit to a memorable location by committing a scene to canvas. This diversity is also reflected in the media used in his work: Watercolour, Gouache, Acrylic, Oils, Conte-Pastel, Pencil, Ink and wash. Richard is happy to work in all of these and often a combination of several is employed to achieve the desired effect. Much of his work is of course by commission both from private collectors and commercial work direct from industry. He has a comprehensive library of reference material from which to work from. An original piece of art makes a unique and special gift or presentation. Birthdays, Anniversaries, Retirement Presentations are all popular reasons to commission an original piece of art. Prices can be as little as £100 for a small pencil or ink and wash drawing rising to as much as £1500 for a large oil on canvas. On the commercial side Richard is available for Greetings Cards, Brochure Illustration, Technical Illustrations, Handbooks, Instruction Sheets and Architectural Impressions and layouts. In fact if you have a need for any hand-generated artwork he will be pleased to discuss those requirements and offer you a quotation. Richard is married to Jane and together they have three daughters and a granddaughter, they have lived in Worth, West Sussex since 1983. Away from the drawing board Richard has many other interests in the world of transport history, he finds time to enjoy his 1935 Singer Le Mans sports car throughout the year and is currently Chairman of the Singer Owners Club committee, he is also an active member of The Vintage Sports Car Club, The Brooklands Society, The Friends of Brooklands Museum, The Transport Trust and last and by no means least, The Guild of Motoring Artists of which he is a founder member. From time to time Richard is asked to give talks, lectures and displays to interested groups e.g. motor clubs, art groups, schools and colleges. These lectures can be on both an informative and/or a practical theme and have proved highly popular, charges will depend on distance travelled please contact Richard if you are interested.